Click Here For FREE Help! You’re site will be secured using our preferred software to detect malicious activity and block hackers. We’ll also perform a login username/password audit to check for vulnerability. We compress your image files to make page loading much faster. Google loves the increase in speed (good for SEO) plus it just makes your site run smoother for visitors. You may already have malware on your site. We’ll do a complete scan and remove any if found. Rest assured, your personal info is safe. Most website owners never even know if their website is offline or unavailable. We use special software to monitor this 24/7 and notify you immediately if your site is offline for any reason. We then start working on a remedy to get it back online. WordPress releases a new version of core WordPress files every couple of weeks or so. Keeping these up to date protects your site from potential security breaches that hackers easily find and exploit. We will keep your site on the most current, stable version. Themes and Plugins are created by 3rd party developers. Updates become available at various intervals and keeping everything up to date can be a daunting task. We monitor for updates and handle everything for you. Keeping these files up to date protects your site from errors and hackers. We back up all files and store offsite on a secure server. If your site ever goes down, gets deleted by accident, or hacked…no worries, we will get it back online from our backup usually within 4 hours. If your site ever crashes or gets hacked, we will restore your site from our backed up files. If for some reason we can’t restore from backed up files, we’ll build you a whole new site for free.n. Don’t worry about tracking down that elusive “website guy” any more. We are here 7 days per week ready to take your requests and get your site content updated or correct your WordPress website issues. We pride ourselves on providing such great service that we don’t have to use contracts. Our services are auto-billed monthly and you can cancel any time. No contract, no worries. We’ve structured our care plans so that even the smallest of businesses can take advantage of our professional website services. With more than 30,000 websites being hacked everyday, and most businesses not taking the the necessary steps for protection; there’s a real need for a service that protects and preserves small business websites. All American Guardian was started to help small business owners keep their WordPress websites up-to date and secure. If your website isn’t protected and you fall prey to a hacker, you could lose your entire online presence. The loss of a website not only makes your business look unprofessional, it could also mean thousands in development costs. Not to mention the amount of time your site would be down while being rebuilt. It’s like skydiving without life insurance…ok, maybe not that serious. The point being, you wouldn’t do it. So why do so many business owners risk it all by not having a website protection plan in place? Maybe it seems overwhelming and they just don’t know how or where to start. That’s where we come in. We’ve been managing WordPress websites for over a decade now. We are professionals, we handle everything for you and we give you peace of mind that your WordPress website will stay up-to date, backed up, and protected at all times. James has been working online since 2005 and has personally developed over 200 websites. His online skills and experience include: website development, WordPress, graphics design, lead generation, SEO (search engine optimization), email list building, conversion rate optimization, Facebook advertising, and general internet marketing principles. He’s also a Registered Nurse so some people simply refer to him as “The Website Nurse.” He started All American Guardian to help small business owners protect their online investments(websites). James resides in the suburbs of Houston, TX and is happily married with 5 children and 1 grandson. 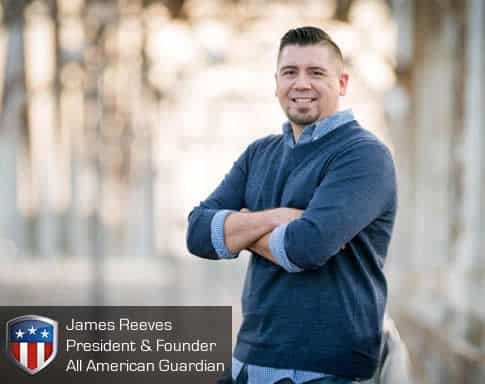 “The President of All American Guardian , Mr. James Reeves, was extremely professional, efficient and courteous while he Upgraded and Reconfigured our Web Site. James’ understanding of of marketing strategies and mastery of internet search engine(s) performance criteria increased our site’s visibility and responsiveness to the generation of new client proposals and professional fee income. In addition to the design and implementation of web strategies ,All American Guardian, is also providing on-going site maintenance and monitoring of web visits to assure the web site’s integrity and identity . M.C. Petty & Company, Inc .